As the father of 3 school-age children and as a graduate from Marquette University High School and then from the University of Wisconsin-Milwaukee, Khary knows the district’s needs. He understands that our schools need to bring all of our children to a college-ready standard and that college costs must be made manageable for anyone who wants their children to have a better life. 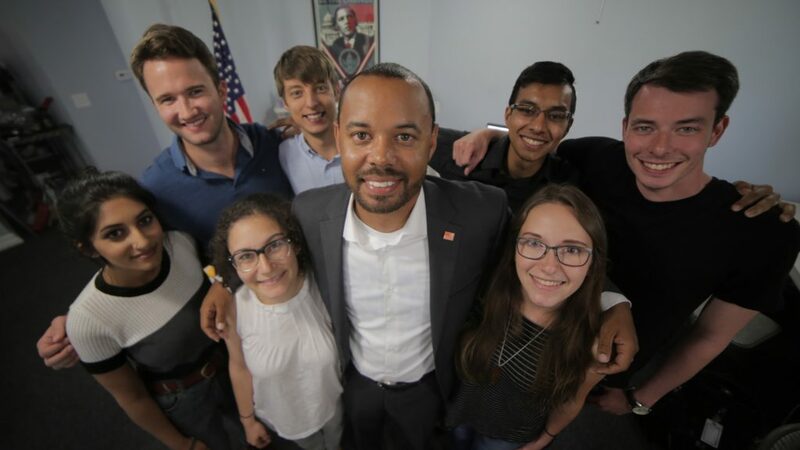 With Khary Penebaker, this District’s families will finally have a Representative whose understanding of the challenges of preparing a child for college is first-hand, rather than based on rumor and distant memory. He sees the daily needs of our education systems to be strong and agile as we move from the typewriter to tablet; the cornerstone of smart growth is ensuring that people of all ages receive the education necessary to thrive in a dynamic economic marketplace. COMMON SENSE STUDENT LOAN INTEREST RATES: The federal government should not charge interest rates on loans to students that are higher than rates on loans to banks, and current students should be allowed to refinance their existing student loan debts. JOB FAIR PORTAL: A complete overhaul of government job-search web resources for new college and technical college graduates, connecting graduates with prospective employers and job opportunities so they can immediately get ahead of their student loan debt and begin building their futures.